I did a lot of things in college. I moved from Colorado to Seattle. I met (and married) my man. I worked a million jobs. I made amazing friends. And I ate pad Thai. No, really. I’m not kidding. I bet I got it at least once a week, and saved the left-overs for the next day, meaning I probably ate it 2 times a week, every week, for the better part of 4 years. I’d never had it before moving here, and it is one of my all-time favorites. Which is why I knew I had, like HAD, to attempt to make it at home. My husband constantly makes fun of me (in a playful, I-totally-can’t-argue-because-he-is-sooooooo-right type of way), about my constant on-a-whim decision making. Cooking, for me, is no different. I get an idea in my head about what I want to make, and there is no stopping me until it is done. Even if there are other things I should be doing. Even if I have to run out to get ingredients I don’t have. Even if the kids are freaking their #*$%. I saw this recipe today. I went to get the ingredients today. I made it today. And I freaked out it was so good today. I would have NEVER thought, in a million years, that it was possible to make pad Thai this delicious in my own kitchen. But, I swear it tasted like it came from a restaurant. No joke. I wouldn’t lie to you. And even though it uses rice noodles – and therefore technically not a whole grain, I also used organic chicken, pastured eggs, organic veggies from the farmer’s market, and coconut oil – so it is a million times better than anything I could order for take-out. 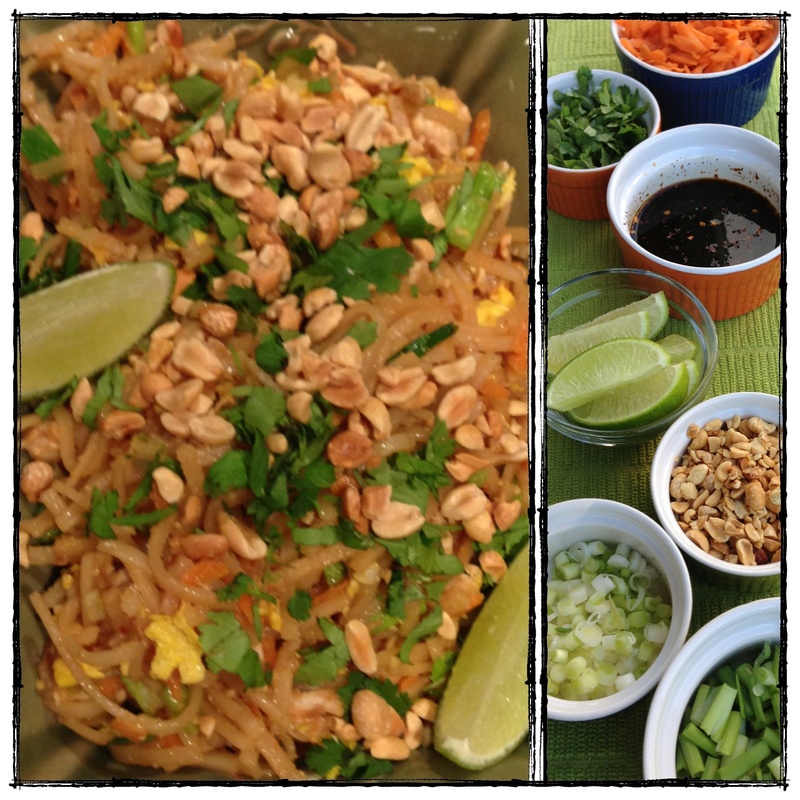 Have you ever asked to see the ingredients in the pad Thai at your favorite restaurant? Yikes. There are like maybe 100. And a lot of them are no bueno. The ingredients here are clean, the sauce doesn’t have anything weird in it, and it was quite possibly the most delicious thing I’ve ever made. If it seems like I’m freaking out about it, it is because I am. Still. Tastiest food of life. Make it. Tonight. For reals. Is that picture blurry? I don’t even care. Could barely even hold off stuffing my face long enough to take one pic. 4 1/2 tablespoons either Tamari Soy Sauce, Wheat Free or Coconut Aminos. Again, make SURE it is organic to avoid those nasty GMO’s, and make sure it is wheat free if you want this dish to be gluten-free. Crushed red pepper flakes, to taste. Original recipe called for Sriracha. Don’t use that. It has 8 ingredients, 2 of which will most definitely be genetically engineered, and 2 of which are preservatives, which you don’t need to consume when you can just use red pepper flakes instead. UPDATED: Go ahead and toss in a handful of bean sprouts, too. I forgot all about em when I made this, but Evan’s husband Justin has informed me they are a necessary component to Pad Thai. 1. Boil rice noodles according to package instructions. I brought water to a boil in large pan, turned heat off, added noodles, and let sit for 10 minutes. Drain water, and set noodles aside. 2. While noodles are soaking, add 1 tablespoon of coconut oil to non-stick pan and add chicken. I chopped up the chicken into pretty small little bites before cooking. I think you should do the same. 3. Once chicken is cooked, drain off any liquid and add peanut butter. Stir until chicken is coated, set aside. 4. In your skillet, add the other tablespoon of coconut oil along with the white part of the chopped onions and the garlic. Sautee until golden brown, and fragrant. 5. Add the eggs and scramble over medium heat until almost cooked. Almost. Not all the way. Take off the heat and set on a plate for a few minutes. 6. Mix together syrup (or organic brown sugar), soy sauce, lime juice, and crushed red pepper flakes in a small bowl and set aside. 7. Back to the skillet. Add noodles, the sauce you just mixed, the chopped green part of the onions, carrots, and chicken. Stir until combined, over medium heat, until noodles are soft. 8. Grab your plate with the almost scrambled eggs. Dump into the noodles, and stir to combine. 9. Cook for another minute or so, until eggs are fully cooked. 10. Plate. Add cilantro, peanuts, and a lime wedge to each serving. This recipe was enough for me and my man to consume heaping amounts, the kids each took a few bites, and there is a little bit leftover for lunch. So I guess I would say it serves 4. Or maybe 3 if you are crazy hungry. 11. See?! Easy! And might I suggest chopping, mixing, and cooking before dinner time? That is what I did and it made the actual cooking part crazy fast and easy. I chopped veggies, mixed sauce, beat eggs, and cooked chicken while my children were napping – so come dinner time, I just had to soak noodles and throw stuff in skillet. 12. Also, if you get the right soy sauce, this dish is gluten-free (Sarah D, Abbey K). And if you omit chicken it is vegetarian (Evan). Add shrimp instead and it is pescatarian (Noelle K). Omit eggs and chicken and it is vegan (Nicole H). You catch my drift? Modify to fit your needs. This entry was posted in Dinner, Gluten Free and tagged chicken, cilantro, erin, green onion, lime, maple, peanut butter, rice noodles, soy by Flax + Honey. Bookmark the permalink. We had friends over for dinner last night and made this…AWESOME! Thanks Erin!